If you haven’t checked out ELB and/or ELBN-1 & 2, please take a look at this page (http://gaia-shamballa.xyz/blog/?page_id=39740) for your review. They will give you a great information and insight in order for you to enjoy your life in this world. At least, you will enjoy the world of wonder, lol. Today, you will read the third session: “Sticking a magical barrier and Oracle by numbers” — which was held on July 22nd, 2018 at Slack & Shamballa School. What is a magical barrier? It does sound familiar, doesn’t it (in some fantasy movies…)? What do you think if such a thing actually does work in a practical situation? Are we all going to be fortune tellers? …. You’ll see how it explains in the session. This is another interesting & practical session which you should be interested in trying out as soon as you finish reading it! All right! without further notice, let’s begin the blog edition of “ELBN-3 : Sticking a magical barrier and Oracle by numbers”!! In 2015, Elizabeth and the Shamballa priest team did release about 43,000 Jewish people who had been locked in the seal to support Shamballa as a human sacrifice since around 1,280 BC while the team was terminating and reconstructing various seals existing in many different places on Earth prior to the Ascension (completed in the end of 2015). Mr. Moe was one of them who Elizabeth pulled up from the seal directly. Born in the tribe of Levi, Mr. Moe has a brother Aaron and a sister Miriam. At the time he was rescued by Elizabeth, he was both physically & mentally unstable so that his mind stayed as a child while his body became a newborn to suddenly an adult. However, he was really popular among the blog readers who had been participating Shamballa special district at that time because of his beauty which has been described as “he was lovely in the sight of God” and the pure mind like a little child. He later moved to Venus to acquire many practical skills and knowledge of a priest, healer and so on. He has been well-liked by many people as the person who keeps searching for the way to improve human consciousness and continues inspiring them as of today while he is an active saniwa in Shamballa. AL：Now, it is time to begin the session “ELBN-3：Sticking a magical barrier and Oracle by numbers”! Mr. Moe, Mr. Sean, thank you very much for this great opportunity!! Sean & Moe : Thank you. So, shall we begin? Sean : Good evening, everyone. This is Sean, kind of a host for this session tonight, lol. The left side face (on above photo) is me. Welcome to this mysterious world again. I hope you will enjoy wondering more of it tonight. I did present the previous 2 sessions as a lecturer, but I do take over the role of facilitator from Mr. Azaf in this time. I also answer your questions at the Q&A. I hope you will enjoy the session tonight. So, this “Enjoy Life (Seminar) Basic Next 3 = ELBN-3” is relevant to the “Enjoy Life Third Seminar” which has been held by Beth in Tokyo, Japan. This seminar is usually allowed to register only after finishing both the First Seminar (8 sessions in 8 month) and the Second Seminar (2 sessions in Spring & Fall – total 4 sessions in a full year). However, you all can jump into the session tonight on Slack. Now, may I present to you Mr. Moses, “the priest of priests” who we call him “Mr. Moe” ? Please welcome him with a big hand. Mr. Moses, welcome to ELBN!! Moe : Good evening. My name is Moses who will be your lecturer for the next 2 sessions starting tonight regarding magical barrier and magic circles. I am sure some of you may know me since a long time ago, but well, there are so many mocks and fakes for the things like “Man of legend” (laughing). Therefore, I do not think I have such an ability, but I volunteered to be the lecturer for the seminar in order to share the joy of accomplishing the subject with you. I hope you will enjoy the session as well as it becomes helpful for your life. Moe : OK, let’s begin. Everyone, are you all ready to use a chair and a fruit of any kinds? If you do not have one, you can bring 2 glasses of water. We are planning to have a fun experiment using them later. I will ask you all to set up a magical barrier as soon as my lecture is over. So, please bring a chair near you if you have not done it yet. As for a magical barrier, you may imagine something like an animation movie which the main character is supposed to protect a sacred place by sticking it (= the barrier) in order to avoid dirty humans, yes? (laughing) What was the name of that movie…? Moe : First of all, I will explain the difference between a magical barrier and a magic circle. Magical barrier has always been pretty closer to people especially those of you live in Japan. It can be referred to as a crossing gate which is set up with something like a stone or a frame as the axis. There are many magical barriers you are familiar with such as a shop curtain called “Noren” (a cloth curtain you sometimes see at the entrance of Japanese shops), fence, Shrine gate called “Torii,” piled salt (a Japanese traditional ritual) and so on. The reason why many Japanese people build a fairly high fence around their houses is because they try to avoid outside energies. They use “Noren” (a cloth curtain) as a partition = Majikiri in Japanese which can also mean to delineate the boundary from evil energies. You may recall the Shimenawa rope (a thick, twisted straw rope with stripes of white paper hung around a place [a thing] to ward off evil spirits) for small islands as an example of the magical barrier using a rock as the axis. Magical barriers always have the axes, and magic circles do not have them. A good example of “no axis” I am talking here is Shinto shrine. A shrine consists of the magic circle. The place you give a prayer and make a money offering in a shrine is not the main body, but the precincts is the area where the magic circle is placed. That is why you have been told not to walk in the middle of the precincts (of a shrine). It is not the passage of God but right above the magic circle. Moe : This is Samukawa-jinja shrine. As you see, there is a wide space spreading in front of the precincts. Moe : This shrine also has the same type of precincts: Kasuga Shrine in Oita. As you see, there is a large space in front of the main shrine where the magic circle has been set up. This particular area produces a strong magnetic field so that nothing can be built on there. Moe : This is Torii gate of Kasuga shrine. Magical barrier is set up with the things like the pole (as the axis). It is pretty delicate & fragile which needs to strengthen every year by the rituals such as Chinowa-kuguri (passing through a hoop made of cogon grass). Moe : The magical barrier you set up can probably be held 30 minutes at the most in the beginning. In fact, there is a principle of magical barrier which the larger range it is, the stronger a magical barrier becomes. Therefore, it should be able to keep for at least 3 months when you stick one to your house after this session. Anyways, the one you are going to perform tonight needs an axis which the chair you have prepared will play the role. Let’s do it together since it is pretty easy. Moe : Now, please sit on the chair with your smartphone if you are reading this blog on it. Those of you who are reading this on your desktop PC should adjust the position which you should be able to see the monitor while taking a seat. If you are sitting on the floor, please do have a seat and read this on your laptop PC or a smartphone. It may be difficult with a sofa/couch, so please do your best to use a chair. Moe : By the way, she is not raising the heel, lol. You are supposed to set up a magical barrier around the chair. I would like you to experience how it feels. Are you all ready now? Can you read this message on your PC/smartphone? All right then, let’s begin. First of all, please take a deep breath lightly, twice, slowly. Then, please imagine a pentagram on the floor which should encircle you. Your chair is the axis in this case so that the magic circle will be formed around the axis. Moe : Please imagine this line of pentagram is drawn on the floor. When you imagine the pentagram, your chair should be located right on the center dot. Your both knees should be within the circle (of the pentagram). It is about 1 meter/3.2 feet in diameter. Let’s all imagine now. Please be careful not to make your chair, arms and/or toes stick out of the edge (of the magic circle). All you need is to make the circle bigger if you feel like they are sticking out. If you can draw the pentagram precisely, the magical barrier will be successful. Now, you will see light rising from the line of the pentagram. That is how you are supposed to imagine. Please maximize your imagination. No one is watching you. Please do not hesitate to imagine yourself right on the pentagram. What color of the light can you see? yellow? red? blue? or may be a pretty thin color. That is the color of your aura. Please imagine the light is spouting above your head. You are now in a tube of the light. Now, let’s touch the wall of light with your physical hand from the inside (of your magical barrier). You probably feel an elasticity such as the surface of the water instead of an elastic wall. Let’s try to pass your hand through the tube. Do you have any sensation? You should get the similar feeling when you tried to touch the shield of your aura in a former seminar. It is like the scene which you try to see outside from a huge soap bubble. You can try to touch (the tube) from outside of the magical barrier as you let the hand through it. You may feel the same way as you touch your aura, or may be even softer. Can you hear any sound or noise? Do you ever feel cold or warm? Then, please go outside of the magical barrier and touch it from outside. You are supposed to stand up and walk out of the magical barrier since the chair is the axis. Please do touch it gently. If any of you are doing the experiment with your friend or a family member, you can touch each other’s magical barrier. It should give you a different sensation. Some people feel the warmness, tingle, coldness or even the wind. It is totally various and depends on the person. You can let us know your impression here. CO : I felt warmness inside and coldness from the outside. AM : I have a tingling and elastic sensation from the outside. It’s… warm inside? SM : I’ve got the similar sensation to CO-san’s! MK : I felt cold outside right after the stinging sensation, then I felt warm when I came back inside. I heard a low, buzzy sound which was barely audible. SY : I have a warmness inside of the magical barrier. It seems to be a little bit steamy. Moe : That is right. Some of you feel difference between outside and inside (of the magical barrier). I was surprised how cool the outside was when I stood up and walked out of the magical barrier. HD : Indeed, it is hot inside. SH : Wow, I can hear a feedback noise right now (in the magical barrier). FR : I have a tingling feeling inside and a fluffiness from the outside. JD : I had a warmness and a slightly tingle on my palm. UP : I feel warmer inside. My skin feels relaxed with it. HK : I am a little sweaty by the heat. CT : I felt the elasticity like a balloon when I touched from outside. Moe : One more minute. Please keep going. JD : It is hot inside even though the air-conditioner is on. TM：I had a stinging and warn sensation. FR : I felt a slight thickness at the edge of the magical barrier. CT : It’s hot inside too. SLY : My heart is pounding inside! and a stinging sensation outside! SH : I feel a different? air-pressure (between inside & outside). Moe : You are all brilliant. UM : It’s hot. I also have a tingling feeling. HK : I feel elasticity inside and tingling sensation from the outside. HN : The edge (of the magical barrier) seems slightly warmer. LG : I basically have the same sensation as others, but there seem to be partially different sensations?! Moe : All right everyone, that’s all for now. Now, let’s close it since you all should be tired. Please sit down on the chair again slowly. To close the magical barrier, you are supposed to make the light wall gradually lower until it all fits into the pentagram. Once the light all fits into the pentagram, let’s turn the light off and bring the image of your usual floor back. Then, please clap your hands once…. Clap!! 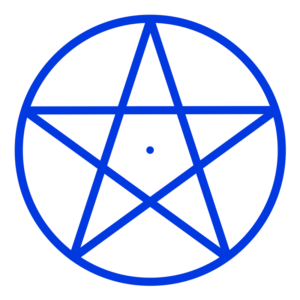 Moe : Some levels of vibration should be produced within the pentagram which seems rougher than the one with the hexagram. Moe : Next, we are going to do the experiment with a hexagram. Some of you might be tired by such a scale of the magical barrier which you have created previously. In fact, you are not supposed to get tired because of the axis; however it should be hard for the people who are not good at imagining things. So, let’s make it with a small axis in this time. That is why I have asked you to prepare some fruits. It is fine with a glass of water which you should prepare 2 glasses in this time. Are you all ready? Now, please make the fruit you have prepared in half. I guess you should cut an apple in half. Please put them aside for now. You should make the space where you are supposed to imagine the hexagram clear. Please do create one within the space even though it depends on the surface you would use for. All right then, let’s imagine the hexagram now. Moe : Please imagine the above hexagram on your table/desk and place the half of fruit you have cut on the dot (of the hexagram). Let’s imagine the light coming out of the hexagram as you have done with the pentagram, then imagine the light completely covering the fruit. If you can, please try to touch (the light) from the outside. The fruit in the magical barrier is supposed to change the taste so that we bring 2 of them to compare later. 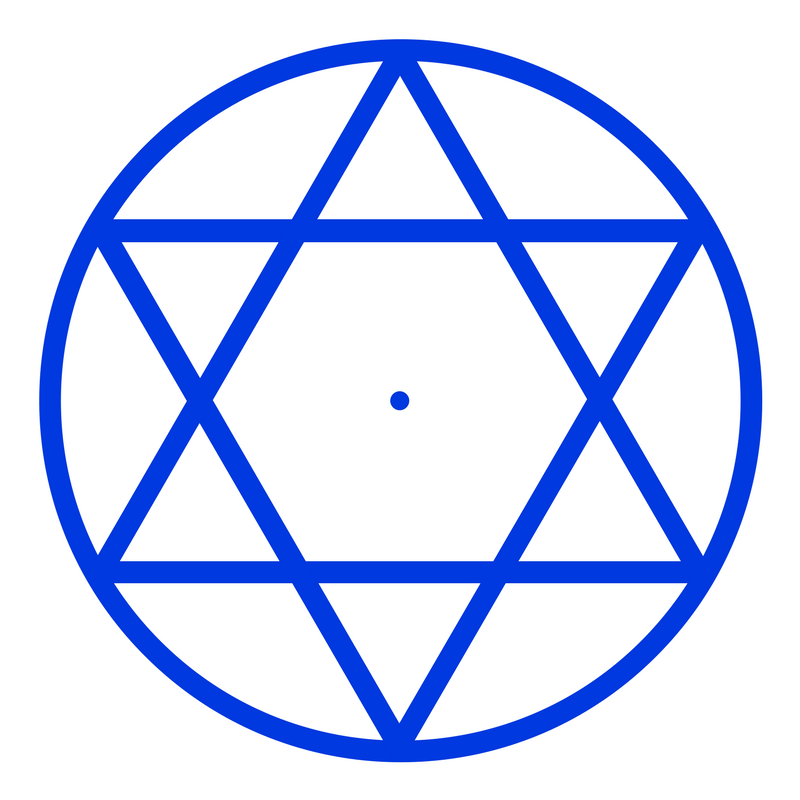 You are supposed to place one of them on the dot of the hexagram you have imagined on the table, that is all. The fruit is the axis in this time. It is exposed to a kind of vibration from the magical barrier so that it may change not only the taste but also the color. It depends on the thing you have placed as the axis. Well, I guess it is about the time. It is same as the time♪ to heat up with a microwave, LOL. Now, you do turn the light of the hexagram off gradually and the hexagram itself is finally disappeared. So, how does the fruit change the taste? Please compare the one you have placed on the hexagram with the other one you have left aside. Please press “Like” if you can recognize the taste change. I would like to hear your comments now. SIN : Oh no! I placed both of them (in the magical barrier)! Moe : Ooops, lol That is too bad. FR : My water became really smooth. SY : I’ve done with a glass of water, and the one in the magical barrier doesn’t have the scratchy sensation in the throat! AM : Water became smooth! CO : I’ve tried with a glass of water. The one with the hexagram seems thicker. LG : I’ve done with a cold tea. The one in the magical barrier became smooth and lukewarm. SH : I’ve placed a kiwi fruit🥝 It tastes thicker (laughing). SLY : The one on the hexagram became smooth & sweeter water while the other one has the sharp taste! HN : I’ve tried with a glass of tap water through the purifier, and the one with the hexagram reduced the smell of tap water. MM : My water also became mild. HD : The smell of the water is totally different (between the 2 glasses). SM : I’ve used mini-tomatoes from Gifu yesterday which I thought it would become sweeter, but I could not really tell, lol. MK : I did use really ripe bananas. The one outside of the magical barrier had a too sweet and strong taste. But the one in the magical barrier became the nicely flavored and mild taste which seemed to be just before too ripe. AJ : I’ve tried with bananas. The one in the magical barrier increased the color, flavor and taste of ripeness. KB : Water. The one in the magical barrier definitely tastes better. JD : I’ve tried with bananas. One I’ve placed on the hexagram tastes mildly sweet! BN : The one (banana) in the magical barrier seems a little thin taste. JU : I’ve tried with bananas as well. Both should be ripe and tasty, but the one on the hexagram adds the mildness within the sweet taste. UP : The banana🍌 in the magical barrier became warmer and mild & deeper taste, the other one seemed colder and clear taste. RU : My kiwi seemed to become deeper taste but not get warmer. AX : My banana became better flavored and without bitterness! JI : I think my banana has a sweeter taste. RF : My apple… I’m not really sure. Moe : It might be hard to check out because of the temperature (It had been really hot in Japan). HYG : My banana became a thin taste. BN : (；ﾟДﾟ)…what? !… my result seems opposite from the rest of participants. H : The kiwi in the magical barrier became stronger its sourness. I prefer the one outside of the magical barrier. CL : Both of my banana and grapefruit became thinner taste. AX : Yeah, the temperatures are definitely different! I’m the same with everyone! CT : Hmmm, (My result was such because) the size was unbalanced when I cut it in the half. It is hard to cut a mini-tomato (laughing). Moe : Apples and tomatoes are both a fruit with sourness. That probably the reason (why you cannot get the clear result). IZ : My water in the magical barrier seemed thicker, rose the temperature slightly and became a mild taste. LV : My water seemed to be taken the smell of chlorine away. FR : The water in the magical barrier became a looser taste. Moe : All right everyone, did you enjoy the experiment? JD : The one in the magical barrier became warmer. JU : I’ve tried to taste both of bananas again. The hexagram banana became softer as well as tasted mild. Magical barrier is pretty easy to set up. Those participants at the live seminar (in Tokyo) do place the rice-cooker in. There were reports that the cooked-rice became really tasty. You can try with a refrigerator in the same way. Please try out since it takes effect for about 3 weeks. Now Sean, it is your turn. Sean : Now, we are going to have the first Q&A. AL-san, please post the questions. Q1 : Why should we avoid right above a magic circle (such as a precinct of Japanese shrine)? Sean : It is the area where the really strong underground electricity exists. That means it is not really good for your health. I cannot say anything bad about it since the place is believed by many people in Japan where a god is (in a whisper). Q2 : There is a precinct (magic circle) at every shrine in Japan, but there are many churches in other countries where no such large space is available in front of them. Does this mean a church has been built without a magic circle or there would be certain conditions in order to set one? Sean : Churches do not use magic circle. They used to build one after burying dead bodies of the opposite side so that it buries the human thought-forms instead of a magic circle. Q3 : Should I make my feet be planted on the floor when I sit on a chair to set up a magical barrier? Sean : It is fine to leave your feet away from the floor. Since a chair is the axis, it should be touched with the floor which you should avoid detaching the chair from the floor with something. Q4 : My heart was pounding prior to the pentagram experiment. It became settled when I moved to the hexagram experiment. What was happening? Is it something related to the experiments? Sean : It is probably because you did not fit the vibration of the pentagram. Hexagram is your frequency. Q5 : The reason why the temperature of water rises and/or food changes the taste is because… it adds the energy? balance? or it becomes shut-off the energies outside? Sean : No, no. It generated the certain vibration. There is no other reason. Sean : Now, the last subject in this session is oracle by numbers which is necessary content for the magic circles we will cover the next session. Even though this will be a brief lecture, let’s do it together. We have made this as easy level as schoolchildren can do so that we will be happy if you enjoy participating this without thinking too hard. In addition to this, we never intend to make you become a fortune teller by this oracle. However, this is unavoidable subject which we all need to use this in order to set up a magic circle, perform a healing and consultation to someone, and see/watch/identify things within a company, organization and eventually a national level. This oracle by numbers is the best way to develop the both micro & macro viewpoints. So, Mr. Moses, are you ready? All right, let’s continue the session. So, we are not going to do any complicated calculation as Mr. Sean mentioned previously. You may doubt the accuracy of this oracle by numbers in the beginning, but I think this is the subject you should be able to understand most once you get the knack since you can confirm by your own eyes other than guardian spirits and/or sense energy. This can be an introduction of a task of Saniwa. (http://gaia-shamballa.xyz/blog/?p=34068#ind6-1) Please try out what you learn here for your friends & acquaintances from tomorrow on. We use this oracle to confirm whether or not a certain priest can enter a magic circle on a particular day. The reason why I have mentioned to you Japanese people to use the Japanese calendar (instead of AD) is because such calculations used to be pretty familiar with people in Japan. Yes, the magic squares Onmyoji (Japanese diviner) used to use are the good examples. By the way, the magic square here means “the way (method) to take up a formation of magic (= principle of God) by the directions.” What we call “magic circle” in this seminar is “the way (method) to take up a formation by magic”… so please do not get it wrong. Now, let’s start the oracle. This means that you can make any fortune telling come true no matter how simple it is if you follow the rule. Have you ever wondered some methods of fortune telling seemed too practical? Actually they are all practical (laughing) even if you smash a pottery. In other words, anything can be used. Moe : Please take a look at the following image. I asked you to prepare name & birthdate of 4 people prior to this session. If you just heard about it, please write your family or friends/acquaintances you know the birthdates. 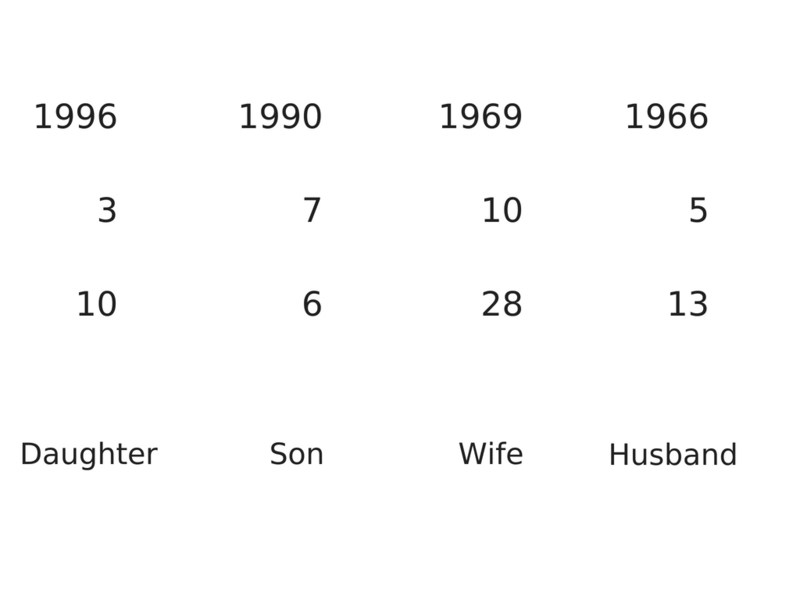 Moe : I have created the birthdate of a family of 4 randomly (top=year, middle=month and bottom=day) . By the way, some people in Japan feel more suitable to use the Japanese calendar than AD. They are the Japanese people who normally use the calendar and/or the foreigners who have been living in Japan. Moe : S represents Showa, and H represents Heisei. Other than AD, please use your most familiar calendar such as Islamic calendar (Hijri calendar), Chinese calendar, Jewish calendar, Hindu calendar and so on. ①　You should look at only the single digit. For the husband in the image (with AD), you use only 6 of the year 1966, 5 of the month May, 3 of the date 13 for any calculations. ②　Let’s write the number by the addition on the side. 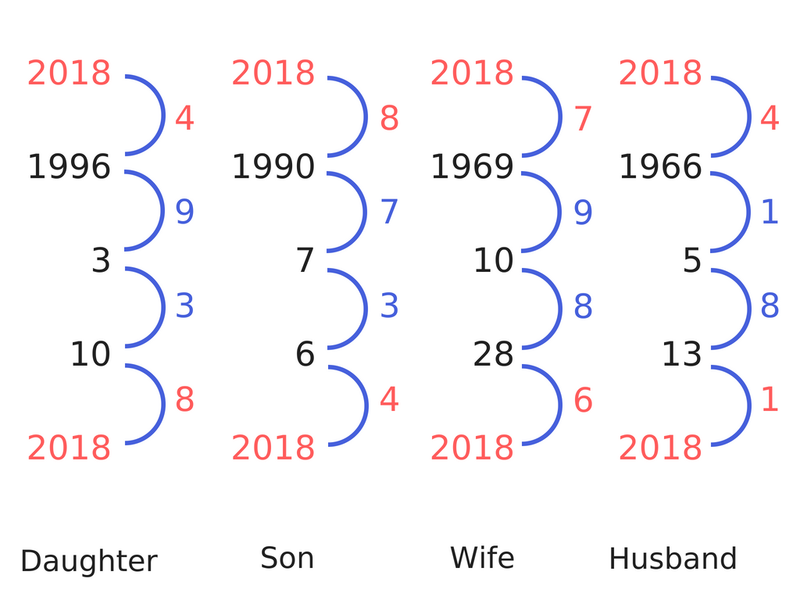 For the husband, you only write 1 out of the total 11 (6+5 = 11) and only 3 for the son’s month + date (7+6=13). Moe : There is no double digits calculation. Easy, isn’t it? Moe : As you see, we have listed both positive and negative expressions. The rightmost column shows the phenomenon which is affected most by the number. Please take your time to review this later. The husband has his own way in his private life and can have many friends in his social life. He especially tends to make light of his own family because he prioritizes his friends & acquaintances too much. The wife always feels loneliness in the family but she feels comfortable to move alone at the same time. She has a wide circle of acquaintances at her work. The son has a lot of troubles with money since he is a little careless with it in his private life. On the hand, he always cares for his mother and he can show his ability more at the workplace where more women older than him are working. The daughter also feels loneliness in the family. She often gets shaken by the words of her mother, and she should work at the place where many women older than her are working. 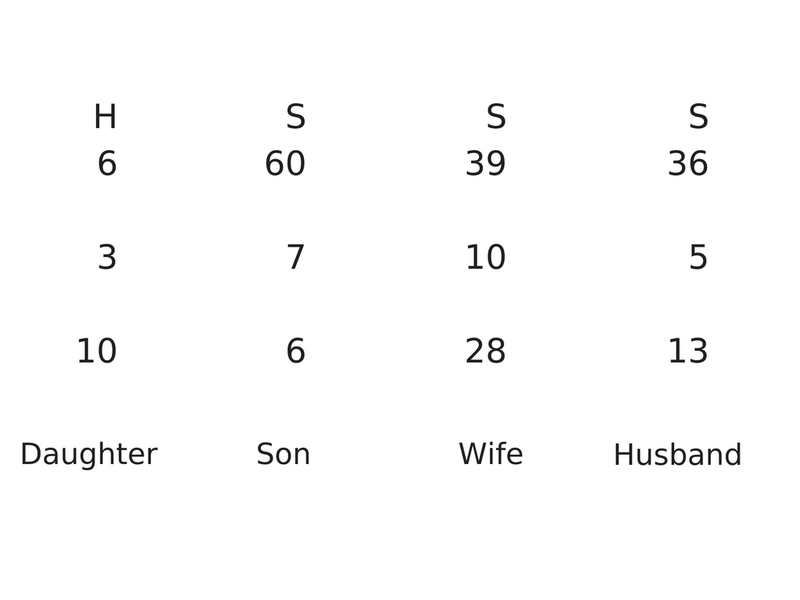 These are the collection of meanings of the above numbers. In addition, the explanation shows a vector of thoughts by the numbers. If two people have the same number, they can either understand each other really well or quarrel with each other because they know each other. If the two people have totally matched numbers, you may think they are very close. However, such two people tend to move towards just one result based of the same vector of thoughts. For example, if such a couple quarrels and the husband says “All right then, we should get divorced!”, the wife will agree with it so that they are supposed to push all their ways to the direction. The reason why a really close couple gets divorced all of a sudden is because of it. ③　Let’s check out the forecast for this year. It is again a simple addition for you to do. Moe : The top red number represents the situation within the family and/or the health condition, and the bottom red number represents the situation at the company or school (for this year). The husband has the number 4 for his private life in this year. This means that he will probably have a hard time to communicate within the family since he won’t say enough words. He should more deliberately explain and put into words what he has in his mind. The number 1 for his public status means he can do anything he wants. In other words, any desires can come true even if he comes up with something negative in his mind. It is good to be positive all the time. The number appears on the top represents private situation for this year and the bottom number shows the social reaction. The wife has the number 7 for her private life which means she can get as much money she wishes while she involves some money-related troubles. As for her public status, she should be extra careful not to hurt people by her harsh words since she tends to use strong words with the number 6. The son can increase his luck with taking care of his siblings and family which the number 8 represents his private life in this year. If he is at a marriageable age, he may get married or add a family member. His number for the public status is 4 which means that he should take a memo and/or give a written instruction to others since he may involve some troubles because he cannot make himself clear. The daughter has the number 4 for her private life which she should always express her requests to family sincerely and clearly since her words tend not be enough. The number 8 for her social side represents a new relationship being established by a change of job or post. Her words can heal people more than she thinks so that she should keep a good relationship with people around her by saying good things and/or cheering them up. I recommend you to check out how the 4 people you have written the numbers have been doing so far since we have already reached the first half of this year. Now, let’s move on to the Q&A. Sean will answer your questions. Q1 : I’ve got 1+9＝10. Is it 0 (zero) or 1? Sean : You are supposed to look at only the single digit so that it should be 0. Q2 : How do I understand the same numbers are turned over between the private and the public? Sean : Do you mean a person has the number but his actual private and the public are turned over? There is a case that the person actually feels turned over, or the actual birthdate may be different. It used to be pretty common in old times. Q3 : In the calculation, should I add Japanese current calendar number “30” for foreigners using AD? Sean : Japanese calendar is used only for Japanese people or whoever feels he/she is Japanese. Q4 : Why can we do the fortune telling by the birthdate? 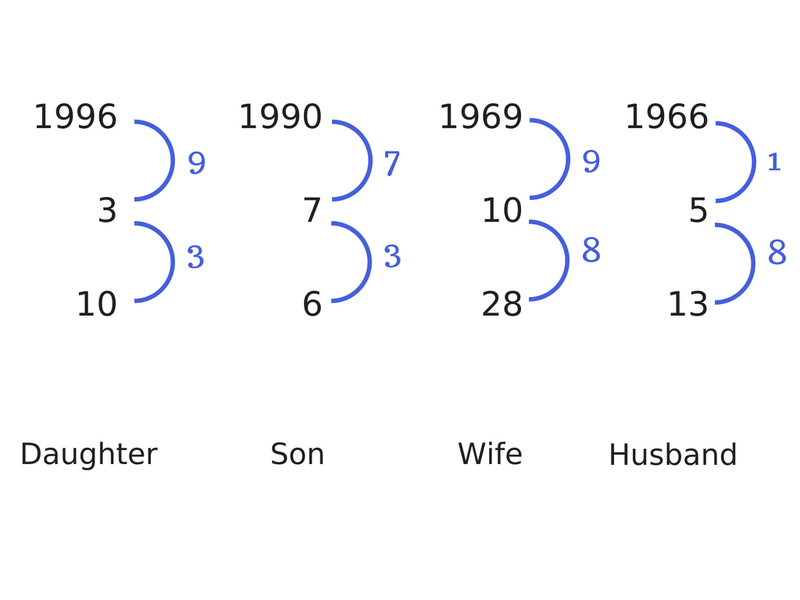 Were we all born with the particular numbers by choice? Sean : As we have mentioned at the reincarnation, when you are supposed to be born should be determined at the moment you die. I am not going to tell you how many days it was supposed to take since the date of your death since you would be honestly traumatized by the information, but we can find out how you died such as a traffic accident, senility or death from a disease and how your mental condition was (at the moment of your death) by your birthdate. Q5 : I’ve checked out my colleagues at work. There are 2 people who belong to the next team but I sometimes work with them too. I think my numbers are stood out from the others. Could you give me advise in order for me to work well with them for a year? (Extra question) Colleague A has the same numbers in this year with her natural combination which is 8 and 0. Is there anything good happening to the person in such a year? Also is there anything we should be careful with such numbers? Sean : Knowing such information in advance makes you learn how you can deal with them as the first move. A-san takes care of her private life very much. So, it should be good to ask her about her family. B-san tends to get into some accidents. So, please say something to her whenever you notice her. She also has two faces according to her number. C-san is pushy to her family, but she is friendly with everyone outside her home and has a good network of people. You should use it. That is her personality. (Answer for the extra question) Yes, characteristic of the numbers should be emphasized so that she should act with extra caution for a little while. There should be full of good things all year round. Q6 : This oracle has different meanings from numerology, doesn’t it? Sean : Yes, because it has the different purpose. The oracle is for setting up a magic circle. Q7 : How can you interpret the person with number 1 for both private and public? Sean : It is like an ordinary car with a turbo engine so that the person is necessary to have the attitude to listen to other people’s opinions all the time. However, it is possible to acquire enormous wealth if everything goes well, so he should watch himself carefully. Q8 : Is it possible to check out the fortune of this year for foreigners if the AD is converted into Japanese calendar? or Is it impossible? Sean : If the foreign person feels more natural to Japanese calendar, that should be fine. But you do not have to bother to change it. Q9 : How can I interpret the number 0 in public with a positive expression? Sean : If you take care of older people, your fortune will sharply uplift. Q10 : According to the table of meanings, the number 5 is described “flat path” as the effect. What does this mean? Sean : It is important to have the time with a flat path which is envied by the people who have the life full of ups and downs. Shakes of fortune become calm, and you can never lose your presence of mind in the face of any situations. Q11 : Yes! (｡≧ω≦)ﾉ I have a question. Mine is 7 on private and 5 on public as the basic, and 2 on private and 0 on public for this year. Could you give me a good advice? Sean : This is the year your money situation is supposed to be swayed in your private life. So, you should never lend or borrow. Your job situation should be smooth. I am sorry, time is up. I will answer the rest of questions later on. AL : Yes, I understand. Sean : How this oracle with the numbers relates to a magical barrier or a magic circle is supposed to be talked in the next chapter. However, you all should verify it by yourself with checking out the numbers of various families, friends, couples and so on. If you can write them down and calculate easily at the next session regarding magic circles, you should be able to handle it all at once. Moe : This is the last chapter of this session. Magic circle and magical barrier are the culture which had utilized in Japan the most back in the history. They became a special ritual handled by certain people only since other ethnic group moved to Japan. Until then, everyone had been using it as an usual tool. This world has been introduced once again in this century. People (on Earth) are required to move forward with understanding of this world which is supposed to have many potentials in the field of weather, dimension and person especially its health condition which no one has ever seemed to be controllable. How did you feel about the magical barrier you have learned today? You might drop your attention a little since the oracle by numbers was introduced during the session, but that should be fine since these two are the set. You will be able to protect you and your friends & family from upcoming disasters and many possible social disorders if you learn this set. At least, you won’t have to be bewildered upon such events if you have the knowledge. You should be able to take the initiative in any situations if you are cool-headed. You can also overcome the tragic mental condition. This means that none of such disasters and chaos in your life is fearful and scary. This is one of the quotes from Shamballa. This means that people should be able to make the life become meaningful regardless of the lifespan. Please do enjoy your life with learning the subject in this time and the next. I sincerely thank to those of you who have been preparing for the session tonight as well as Mr. Sean who has had dozen of meetings with me. I hope you will have a great time at the next session as well. AL : Mr. Moe, thank you very much! Everyone, please give a big hand again to Mr. Moe and Mr. Sean!! H : Thank you very much, teachers and those of you who have been taking care of the session. SIN : Thank you very much. SM：Mr. Moe✨Mr. Sean✨Thank you very much! HN：Thank you very much💖 It was really fun. MK：Mr. Moe, Mr. Sean and staff members in Shamballa, I sincerely thank you very very much! TK：Thank you very much. I’m really thankful for the session. Thank you very much for taking your precious time to read this entire session of ELBN-3. I hope you all did enjoy reading and actually do try out the magical barriers and the oracle by numbers. You will be surprised how effective they are in your everyday life. Of course, you can enjoy them as a game too. Magic and oracle seem to be treated as a fake or occult items. We might have been forced to believe them in such a way in order to become an easy slave of whoever controls the world. Well, you can still believe what you like to do, but it is not a bad idea to check out some different streets sometimes. You may find something very interesting and helpful for you and your family & friends. I hope many of us gradually feel free to enjoy using such tools for ourselves and family & friends without any hesitation. Thanks again and hopefully see you again at the next & the last ELBN session (ELBN-4：Forming magic circle and Using magical items)! !